Israeli agents who kidnapped Nazi mastermind Adolf Eichmann from Argentina in 1960 found the notorious death camp doctor Josef Mengele but let him get away, one of the operatives said Tuesday. 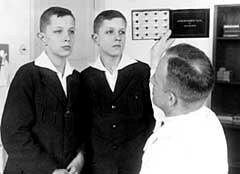 Mengele was one of the most wanted Nazi war criminals, a doctor who conducted cruel experiments on twins and dwarves at the Auschwitz concentration camp and killed children with lethal injections. He selected prisoners who would be subjected to his experiments and sent others straight to their death in gas chambers. Rafi Eitan, now an 81-year-old Israeli Cabinet minister, told The Associated Press on Tuesday that he and other Mossad agents located Mengele living in a Buenos Aires apartment with his wife at the time of Eichmann’s capture in 1960. But they decided that trying to nab him would risk sabotaging the capture of Eichmann, who implemented Adolf Hitler’s “final solution” to kill European Jewry and was deemed a more important target. It was known that Mengele was living in Buenos Aires around the time of Eichmann’s capture. But Eitan’s comments indicated the Israelis were closer to him than had been previously thought — and shed light on why they decided to abandon an attempt to catch him. “When you have one operation, you’re taking a certain level of risk. If you’re doing a second operation at the same time, you double the risk … not only for the second operation but for the first one, as well,” Eitan said. Eichmann was responsible for implementing Hitler’s plan that exterminated 6 million Jews during World War II. After his capture, he was spirited to Israel, tried and executed. After the war, Mengele fled Germany under an assumed name and ended up in Argentina, a popular refuge for many senior Nazi officials. Informants working with the Mossad had seen him while the agents were in Buenos Aires, Eitan said. The Mossad men located Mengele’s apartment, and on one specific day even knew he was at home, Eitan said. But the next day, Mengele left with his wife for what the agents believed would be a temporary absence. At the time, the Israelis had already snatched Eichmann and were holding him in a safe house while they waited to whisk him out of the country. They feared that if they waited for Mengele to come back, the Eichmann operation would be discovered. Eitan said they decided it was not worth the risk. “When I have a bird in my hand, I don’t start looking for the bird in the bush. I’ll take the bird in my hand, put it in a cage, and then deal with the one in the bush,” Eitan said. By the time the Mossad sent a team back to Buenos Aires a few weeks later, it was too late. “After Eichmann’s capture was made public, he disappeared entirely,” Eitan said. After missing him in Argentina, the Mossad had another shot at catching Mengele in Sao Paolo, Brazil, two years later, Eitan said. But the organization had other “operational priorities,” and Mengele got away again. He would not say what those priorities were and the Mossad then lost track of Mengele. Having eluded capture for 34 years, Mengele drowned in Brazil in early 1979 and experts identified the body as his six years later. An October 1992 U.S. Justice Department report on Mengele’s whereabouts and activities after World War II provides a timeline that raises questions about Mengele’s whereabouts in 1960. It says Mengele arrived in Argentina in 1949 but left in 1959 and became a naturalized citizen of Paraguay. After Eichmann was captured in May 1960, Mengele moved to Brazil, according to the report by the Office of Special Investigations (OSI), which tracks Nazis. David Marwell, a former chief investigator at the OSI, said Mengele did move around South America and even if he left for Paraguay in 1959, he could have been moving between Paraguay and Argentina until Eichman’s capture, which forced him underground. Marwell said it has long been known that Mengele escaped from Argentina and Eitan’s claim that the Israelis had known his whereabouts but let him get away was virtually impossible to verify. “It does not add much to our understanding of it and it would be impossible to research because you’re talking about an internal decision, so you take him at his word,” he told the AP. OSI documents also show that Isser Harel, who oversaw the kidnap operation, told the OSI the Israelis attempted to capture Mengele in May 1960 at the same time they caught Eichmann. According to Harel, Mengele was able to escape, going underground after reports of his whereabouts appeared in the media, the OSI documents say. Asked about Eitan’s account which first appeared in Israeli media this week, historian Avner Shalev, chairman of Israel’s Yad Vashem Holocaust memorial authority, said the Mossad made the right decision to concentrate on Eichmann because he was more important than Mengele. After Eichmann was caught, the Mossad considered expanding its activities targeting Nazis, said Efraim Zuroff, a Nazi hunter who heads the Simon Wiesenthal Center’s Jerusalem office. But the organization eventually shifted its resources elsewhere, he said, and Eichmann remained one of only two significant Nazi captures the Israeli secret service had. Eitan, who headed the shadowy “Lekem” unit of the defense ministry, took responsibility for the operation that recruited Jonathan Pollard, an American naval analyst who was caught spying for Israel and sentenced to life in prison in one of the most damaging episodes in Israel-American relations. Associated Press reporter Carley Petesch and investigative researcher Randy Herschaft contributed to this report from New York.